Metrorail is now completely shut down for 16 straight days in a stretch of the Blue, Orange and Silver lines. There is no train or bus service between Arlington Cemetery and Rosslyn on the Blue Line. Metro says commuters should use the Yellow Line. Shuttle buses will not be able to handle the volume of riders trains carry, Metro said. Although some commuters already navigated life during the first "surge" of Metro's already-aggressive maintenance plan... it's a whole new ballgame now. Metrorail service is shut down in a segment of the Orange, Blue and Silver lines in D.C.; two stations are closed, and another two have travel only in one direction. In addition, service has been eliminated between two stations in Northern Virginia. The Orange, Blue and Silver lines are shut down from Eastern Market to Minnesota Avenue and Benning Road. The Potomac Avenue and Stadium-Armory stations are closed. There is no Blue Line service in D.C, Maryland or Rosslyn. In Northern Virginia, there is no train or bus service between Arlington Cemetery and Rosslyn on the Blue Line. Metro says commuters should travel via L'Enfant Plaza instead. Orange and Silver Line trains are running every 10-12 minutes before 10 p.m. After 10 p.m., trains run every 20 minutes. Metrorail service is shut down in a segment of the Orange, Blue and Silver lines in D.C.; two stations are closed, and another two have travel only in one direction. In addition, service has also been eliminated between two stations in Northern Virginia. News4's David Culver has more on how riders are handling the new commute. Officials have warned commuters to make alternate transportation plans immediately, if they haven't already, for the second of Metro's "safety surges." 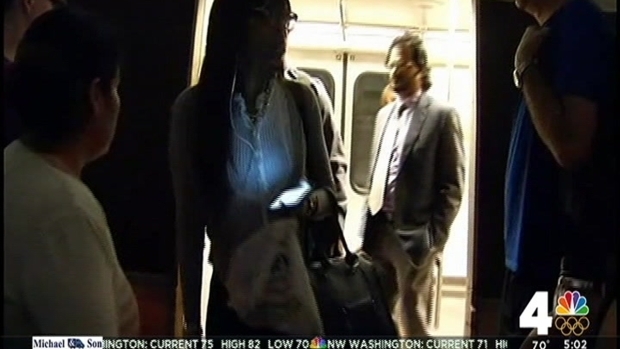 Commuters are asked to work from home if they can. "With a total shutdown, it's not like we did two weeks ago," said Metro's General Manager Paul Wiedefeld. "...The only option is shuttles, and literally, they cannot replicate what we do on trains." Wiedefeld said the Orange/Blue/Silver line shutdown is in a difficult area in which to work, because the normally busy stretch of track is along an elevated structure that stretches across the Anacostia River. Shuttle buses have replaced trains in that area, but Metro officials said they may be extremely crowded and will not be able to handle the volume of riders that area of the Orange, Blue and Silver lines normally accommodates. 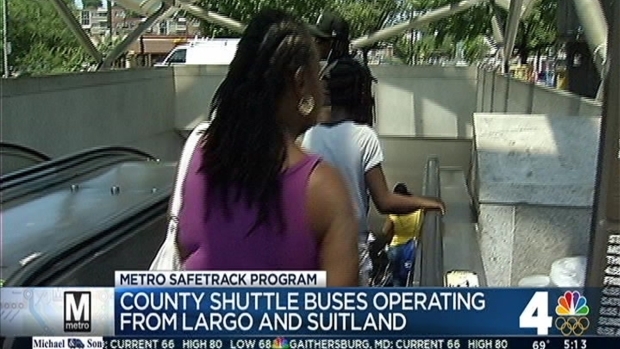 Shuttle buses will replaced trains in areas that have been shut down by Surge 2 of Metro's Safetrack. News4's Derrick Ward has more on how officials in Prince George's County are helping riders navigate the difficult commute. "The shuttles are working, but they just can't replicate what we move on the trains. It just cannot do it," Wiedefeld said early Monday. "We need people to carpool, telecommute if they can. Anything to take the stress off the peak period." Metro also advised riders traveling to or from Virginia to take the Yellow Line across the river. Prince George's County residents were expected to be particularly hard-hit by these shutdowns. On weekdays, the county has free shuttle bus service from the Largo station to the Suitland station. Ten buses will operate during morning and evening rush, while five buses will run between 10 a.m. and 3 p.m. The county has shared a list of all travel alternatives for residents; you can find it online here. Yellow Rush+ trains are running all day; riders should use the Yellow Line for service between Virginia and D.C.
After 10 p.m., Blue Line service will stop; riders should use the Yellow Line instead. All other trains will run every 20 minutes. Metro said extra service is being added on the T18 route between New Carrollton and Rhode Island Avenue and on the 97 route between Capitol Heights and Union Station at rush hour. Additionally, X9 buses will run from Minnesota Avenue to Metro Center all day. Regular Metrobus fares are $1.75, and 85 cents for seniors and people with disabilities. Express bus fares and airport express routes cost more. Bus-to-bus transfers are free if you're using your SmarTrip card. Biking: The Washington Area Biking Association (@WABA) previously tweeted this Google map of D.C.-area trails, bike lanes and bike-friendly roads. Find information on Prince George's County bike trails here. If you need to tune up your biking skills, check out WABA's classes on learning to ride and urban cycling online here. Need to rent a bike? Capital Bikeshare stations are located throughout the area; you can see rates or sign up here. Circulator: D.C.'s Circulator buses run every 10 minutes during these hours; most routes start at 7 a.m. on weekdays, although some start at 6 a.m. In addition, D.C. Muriel Bowser said the District is considering extending the Circulator's service hours. See the current schedule here, and click or tap the name of any of the bus routes to see exact pickup spots. Driving: Drivers should expect increased traffic and are encourageed to carpool or travel outside of peak periods if possible. If you must drive, leave yourself plenty of extra time to get around. In addition, D.C. has expanded parking restrictions during SafeTrack (find details here), and will have more traffic control officers on the streets. MARC Train: Commuters traveling to or from Maryland should consider the MARC train, which has several lines running through the Maryland suburbs, including New Carrollton, to D.C.'s Union Station. Additional regional buses: Check the schedules for Arlington County's ART bus, Alexandria's DASH bus or Prince George's County's The Bus. Streetcar: The new D.C. Streetcar system runs from Union Station along H Street NE. Fares are currently free. Streetcars run about every 10-15 minutes. Learn more on how to ride here, or see the system map here. Taxi: You can, of course, hail a cab on the street, but you can also order one online or by phone. DC.gov has a list of District taxi companies online here. Arlington County has seven authorized taxi companies; find them here. In Prince George's County, several cab companies are authorized to operate; contact info for the county's dispatch service is online here.